Wales head coach Warren Gatland says he already has a clear idea of his team to face England ahead of his side's World Cup opener against Uruguay. Gatland has rested several key players for Sunday's match against the South Americans at the Millennium Stadium. Wales take on hosts England at Twickenham on Saturday, 26 September. Asked if places in the team to face England were up for grabs against Uruguay, New Zealander Gatland replied: "Not really, no." Wales have rested Alun Wyn Jones, Taulupe Faletau, Dan Biggar, Jamie Roberts and George North against Uruguay. Gatland's side is expected to win convincingly against the Pool A minnows, with some predicting that Wales, England and Australia's hopes of progressing from the group to the quarter-finals will depend on points difference. But Gatland says the primary aim against Uruguay is simply to win. "I don't think our group for us is going to come down to points difference," he added. "We'll be endeavouring first to win the game and, after that, potentially scoring points. "It's not disrespecting Uruguay in any way. The first priority is to win and I think we've got to put a lot of focus into these first two games." One of the most eye-catching selections for the match against Uruguay is the decision to partner captain Sam Warburton with Justin Tipuric in the back row. Both are naturally open-side flankers, so Warburton has switched to the blind-side, as he did the last time both players started together in 2013 when Wales hammered England 30-3 to seal the Six Nations title. 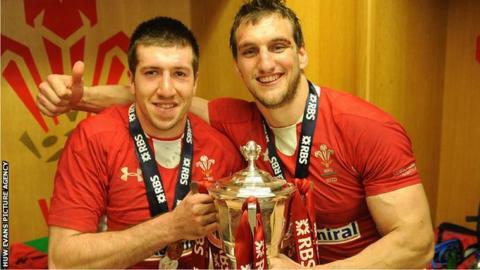 "It's been widely speculated about, the quality of those two players," said Gatland. "Personally I thought Sam Warburton was man of the match against Italy, even though he wasn't awarded it. "That would have potentially taken a bit of pressure off us if he had got man of the match because people want to leave that debate open. "We're in a great position to be able to pick two world-class players in that position."